Dangers of talc/baby powder and a health alternative! For years, I’ve used Johnson & Johnson baby powder for all sorts of things; in shoes for clammy feet, cosmetic uses, deodorant, on your sheets when it’s hot in the summer, and my favorite use is on oily hair. Whenever I don’t have time to rewash my hair before a meeting, I throw some baby powder in my hair to dry out my roots. I’m not sure if I’m the last one to hear about this or not but baby powder/ talcum powder is pretty gnarly. The bottom line is; switch to Organic Cornstarch. 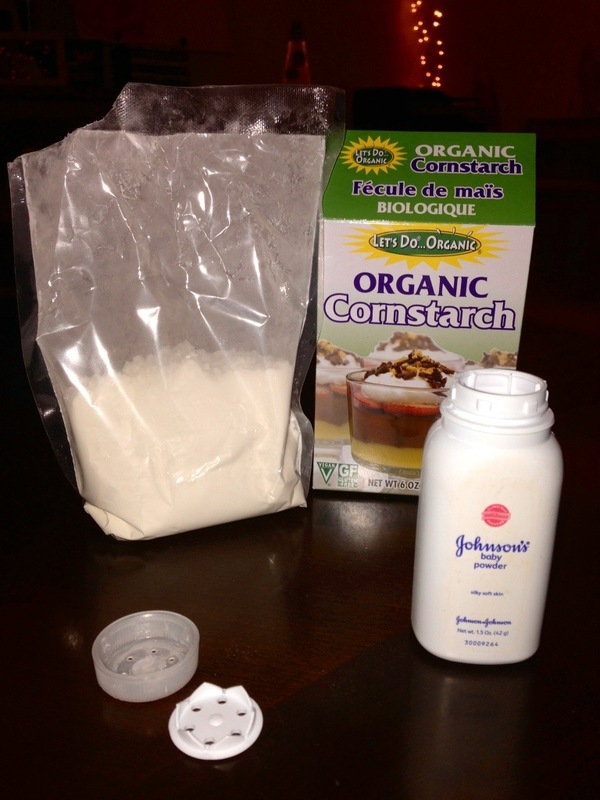 Above is a picture of my old baby powder bottle that I emptied out and refilled with organic cornstarch. Go talc free and make sure to check the ingredients on other cosmetics as many powders contain talc. Britt, that Huffington Post article is at least partially inaccurate. (I expect better from them; they’re usually very good about checking their information.) Although Johnson & Johnson still manufactures talc baby powder, they also manufacture a pure cornstarch baby powder, and have done so for at least nine years. (I’m pretty sure that they’ve been doing so for significantly longer, but the bottle I’m staring at as I type this dates back to ’04.) J&J’s own employees have been recommending the cornstarch over the talc for ages because of the very issues you’ve cited. You’re absolutely right about organic being better than non-organic cornstarch though, but the J&J cornstarch will work well if you’re in a bind. Hi Cyrax! I’m not really sure which part of the HP article you believe is inaccurate? My warning to avoid talc powder came from several sources of peer reviewed data citing potential risks of talc powder, commonly distributed by Johnson & Johnson. The blog post above isn’t particularly concerned with who manufactures the talc powder, but instead, a warning to avoid the substance altogether and substituting a healthier option. Britt, below is the passage from the HuffPost article that I take issue with. Manufactured by Johnson & Johnson, and widely distributed by Osco and Walgreens… women have been persuaded by advertisements to dust themselves with talcum powder to mask alleged genital odors. The article makes it sound as if J&J is pushing the talcum powder, (as opposed to the pure cornstarch/Zea Mays powder,) when they’ve actually used the pure cornstarch in their advertisements for more years than I can remember now. Although there are some drugstores that do still carry the talcum powder, it’s my understanding that they have to specifically request it in order for J&J to provide it to them; if they just ask for “baby powder,” J&J sends them the Zea Mays powder. Don’t get me wrong, I completely agree with you that for most people, (myself included,) cornstarch powder is a much healthier alternative to talcum powder. However, for those with a corn allergy, talcum powder is unfortunately the lesser of two evils. Those without the aforementioned allergy should definitely avoid it though. I work around talc all the time, and I try to avoid breathing it as much as possiable. We grind it into powder form around 325 microns and smaller. The dust hangs in the air for hours, and can get so thick that you cant see 10 feet in front of you, and After a few mins I can feel my nose and throut start burning, and i know it cant be good for the lungs if it does that so quickly. What is the worst thing that can happen if you breath the dust for long periods of time? Can it cause any type of rash from exposure? How much does it take to damage the lungs? It can cause some forms of cancer, and inflamed lungs from over exposure to breathing in the talc. I was just wondering how you get the top off of the powder bottle? I can never figure it out!